He-Man and the Masters of the Universe Magazine #16 is the Fall 1988 issue – it’s also the final issue. We couldn’t get through the full run of an eighties magazine that regularly ran features on child actors without getting Fred Savage in here, could we? Heavens no. 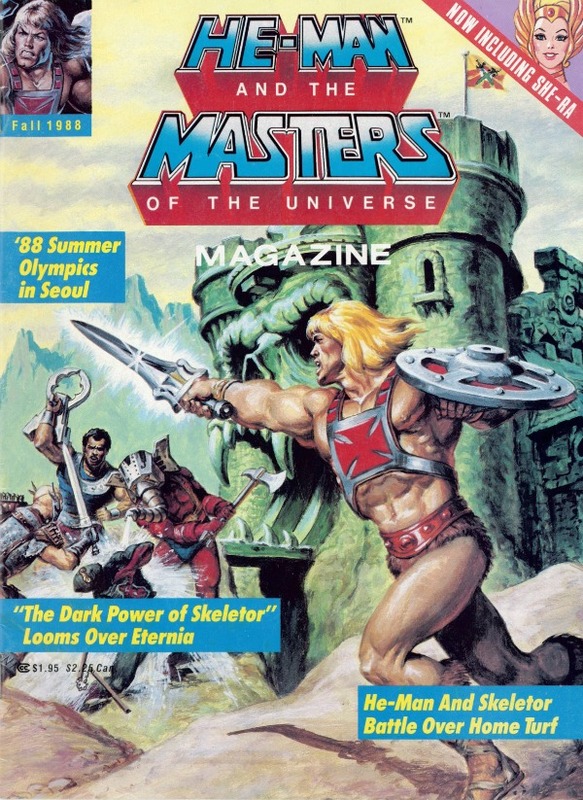 The non-He-Man content features another of those misleading and out-and-out wrong “facts” – pizza is “nutritious” because it includes all four food groups and is “full of ingredients that are really good for you.” There’s also a three-page feature on the Summer Olympics – now featuring all those communist countries that stayed home last time! And there are two piddling activities that aren’t He-Man themed. It’d be a shame for this magazine to go out without a properly ridiculous comic story, and this issue doesn’t disappoint. “The Dark Power of Skeletor” features the He-Man version of kryptonite, He-Man burrowing through the ground like a cartoon gopher, and the day being saved by the unintroduced and never-seen-again character Strobo, who was clearly thrown together using Zodac’s head, Sy-Klone’s body, and Randor’s cape, and who looks kind of like Batman, if Batman didn’t wear clothes. The Earl Norem poster, the gatefold edition of the cover, features He-Man, Skeletor, and other characters with recently-released action figures doing battle (in which Ninjor looks to be on the verge of suffering the ultimate indignity: getting killed by Snout Spout). If you’re disappointed that this magazine has finally stumbled to a merciful end, well, there’s always all that Captain Power bonus content to get you through.